The consequences of nursing home abuse and neglect may have far-reaching, long term effects on injury victims. Relatively minor health conditions can quickly turn into potentially dangerous infections, seriously jeopardizing the health and welfare of the individual. One serious complication can be bone infections known as osteomyelitis. 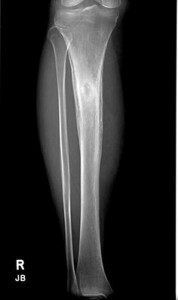 Osteomyelitis can result in dead or infected bone, requiring extensive treatment and possibly surgery or amputation. If your loved one developed a serious bone infection like osteomyelitis while under the care of a nursing home, assisted living facility, hospice, or hospital it may be due to nursing home abuse or neglect. Bone infections like osteomyelitis may be caused by infected tissue, like a bed sore or urinary tract infection. Bacteria reach portions of the bone susceptible to infection via the bloodstream. Serious injuries to the bone itself may result in bacterial infection. Elderly adults confined to their beds may be especially vulnerable to contracting osteomyelitis since they are at risk of developing bedsores and urinary tract infections if they are not properly taken care of. Injuries like osteomyelitis may be preventable if staff take reasonable measures to prevent serious injuries. Nursing homes and assisted living facilities have a legal duty to exercise a certain standard of care when taking care of their residents. This includes re-adjusting bedridden patients to prevent bed and pressure sores from forming and taking reasonable steps to ensure infections do not arise from inserting and removing catheters. Doctors may need to perform a variety of tests to diagnose osteomyelitis. Blood tests may show an elevated white blood cell count, the first indication a patient is fighting off an infection. Depending on the circumstances, physicians should take reasonable steps to diagnose the reason for a patient’s white blood cell count. X-rays cannot usually detect the early stages of osteomyelitis. CT scans or an MRI may be better suited to catching a bone infection before it becomes more serious. Perhaps the most effective way to diagnose osteomyelitis is a bone biopsy, where a doctor will remove a small piece of bone to run tests on and determine what strain of bacteria is causing the infection. Nursing home abuse and neglect victims may suffer serious complications from contracting osteomyelitis. Bone death resulting from a loss of circulation to the infected area of the bone can be devastating. While small infections may be able to heal, large infections may result in amputation. Septic arthritis is another debilitating injury related to bone infections. If the infection spreads through the bloodstream to a patient’s joints, he or she may develop arthritis. Patients with artificial limbs may be especially susceptible to developing septic arthritis from osteomyelitis. Open sores draining with pus are at a high risk of developing squamous cell cancer (SCC) in the epidermis (top layer of skin). SCC tumors are malignant and may spread to other parts of the body. Nursing homes and assisted living facilities may attempt to cover up their abuse and neglect of our beloved family member entrusted to the facility’s care. As an advocate for the vulnerable and underprivileged, The Cochran Firm, D.C. vigorously investigates and prosecutes suits against perpetrators of nursing home abuse and neglect. Our nursing home abuse and neglect attorneys offer injury victims and their families free legal consultations and represent their clients on a contingency basis. This means there are absolutely no up-front legal fees unless we win your case. Fill out an online contact form with the details of your case or call us at 202-682-5800 during business hours. You can also speak to a representative 24 hours a day by calling our toll-free number at 1-800-THE FIRM (843-3476).